Thank you for your support during this difficult time. Please enhance this tribute to Patricia by adding your memories and photos. Patricia (Pat) Galbraith Austin, 90, passed away at Tore's Homes on April 12, 2018 after a period of declining health. Born in Brevard in 1927 to William C. and Mildred Austin, who preceded her in death, as did brother William S. and sister Jeanette Austin. She is survived by her sister, Joan Keirstead (Richard), nephews Steven and James Keirstead and great-nephew Nicholas Keirstead and great-niece Cecilia Keirstead. Photography was her profession but music was her passion. After finishing the Brevard public schools she graduated from Brevard (Junior) College and got her Bachelor of Arts degree in music, majoring in French horn, from the Woman's College of the University of North Carolina (now UNC Greensboro). She did graduate studies at the Eastman School of Music in Rochester, N. Y. After her return to Brevard, she played with the Asheville and Hendersonville Symphonies, the Brevard Chamber Orchestra (which she helped organize with conductor Jackson Parkhurst) and its successor the Brevard Philharmonic. More recently, she was with the Brevard and Hendersonville Community Bands. Periodically she played with the Brevard College Band. She also helped assemble a harpsichord kit for the College. For several years Pat was a member of the St. Philip's Episcopal Church choir. In 1944 she attended the inaugural year of the Transylvania Music Camp (now the Brevard Music Center). 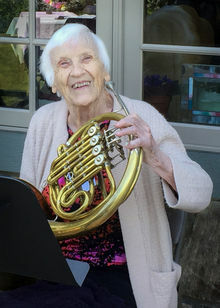 Most recently she enthusiastically joined a group of fellow horn players for monthly "jam" sessions until September 2017, when her health declined significantly. In 1954 Pat and her sister Jeanette took over management of Austin Art shop (formerly Austin's Studio) following the death of their parents in an automobile accident. Pat, who had worked at the shop since her teens, did portraiture and commercial photography as well as black and white processing and retouching. She compiled a slide show from many historical pictures of Brevard and Transylvania County taken by early photographers and her father, which she displayed to many audiences. She loved cats, birds (separately) and certain dogs. Other pleasures were candy, shortbread cookies and sharing the delicious pecan pies she baked. A celebration of her life will be held on Saturday, May 12, 2018 at 2:00 PM at St. Philip's Episcopal Church. In lieu of flowers, memorials may be made to the Brevard Community Band, P.O. Box 1911, Brevard, N. C. 28712, the Transylvania County Historical Society, P.O. Box 2061, Brevard, or the charity of one's choice. What a special person Pat was! The whole Austin family has been part of all our lives if we grew up in Brevard. My mother-in-law, Janie Chapman, went all the way through school here with St Clair Bill Austin. Pat made my engagement announcement photo that was in the Transylvania Times. The families collection of photos has been an absolute treasure to our county. We appreciate the Austin family and will miss Bill and Pat and Jeanette. Blessings to the Austin family. Pat's beautiful smile, her gracious ways and her love of music, birds, cats and astronomy will remain with us. Brevard's history always seemed alive when Pat related stories about her childhood days. A dear lady. I worked at Austin Studio in 1968-69 with Jeanette, Bill and Pat. Jeanette was the business end of the operation, Bill was the frame maker and Pat was the calming effect for the whole place. Sweet people , enjoyed them all, but Pat was a very sweet and special lady.